Being that the day went spending dough on stuff, I didn’t start until about 7pm. And this weeks pie needs a lot of attention. It won’t be piped until tomorrow morning. 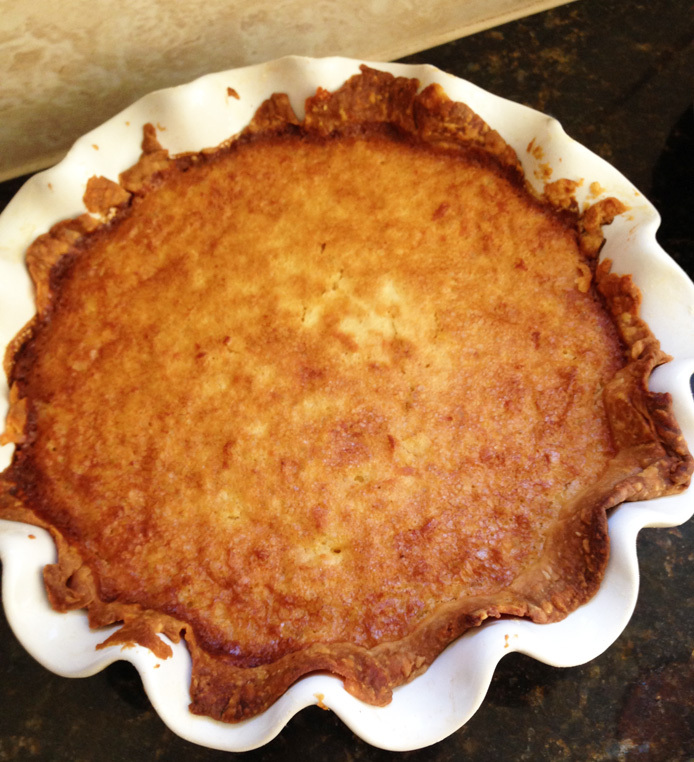 This week it’s lemon macaroon pie, courtesy of Bon Apetit Deserts by Barbara Fairchild. Blend both flours, sugar and salt in food processor. Add butter and shortening; using on/off turns, cut in until mixture resembles a coarse meal. Add 3 tbsp. ice water and process until moist clumps form. Add more water by teaspoon full if dough is dry. Gather dough into a ball, flatten into disk and wrap in plastic. Chill at least an hour. Position rack in bottom third of oven and pre-heat to 350F. Roll out dough on lightly floured surface to 13 inches diameter. Transfer to dish. Trim dough to half-inch and fold under. Crimp decoratively and freeze for 15 minutes. Line crust with foil and fill with dried beans or pie weights (I have pie weights!). Bake until crust is set and edges are pale golden, about 20 minutes. Remove the foil and beans (or weights). Cool completely on rack. Maintain oven temperature. Using and electric mixer beat the eggs, egg yolks and salt in a large bowl to blend. Add sugar, and beat until mixture is thick and fluffy, about a minute. Beat in coconut, whipping cream, lemon juice, lemon peel, melted butter, and vanilla and almond extracts. Pour into crust. Bake until filling is golden and set, about 40 minutes. Cool pie completely on rack and then chill until cold, about 3 hours. Note that I’m typing this at 11:45 pm CST. And the pie is still in the oven. I guess, I’ll have a slice for breakfast. I’ll drop in a picture too. Enjoy your Independence Day, however you choose to celebrate! 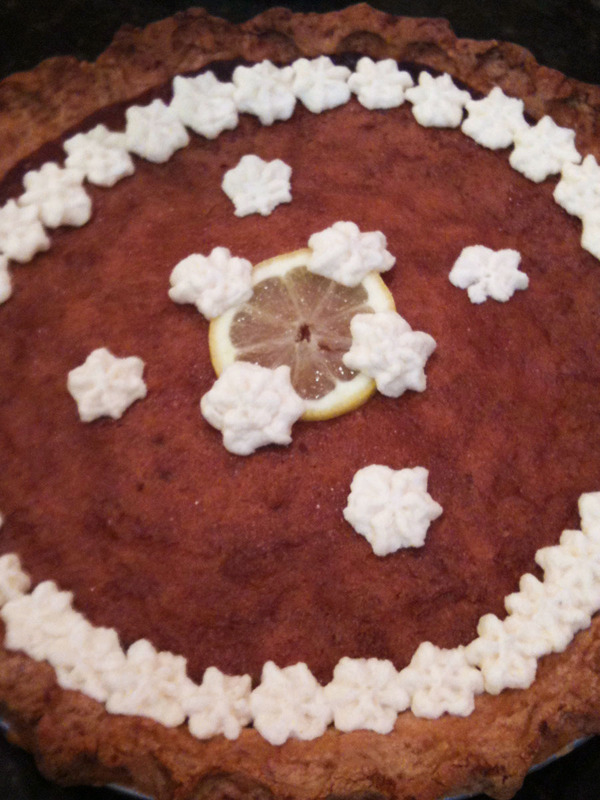 An update on July 4-Finally got the pie piped with whipped cream and garnished with the lemon slice at around noon. The pie has a good taste of lemon but there’s a heavy texture of coconut that I’m not too crazy about. The crust baked well and thankfully didn’t burn. Pie collars are important:)Coming from a Bon Apetit cookbook, I’m bummed this doesn’t have a bigger lemon pop to the flavor. It’s average to me. Too bad, considering the amount of time it took to put together. I guess I’ll have to drown my disappointment by going out and looking for a sectional sofa.